Contest ends on Friday, July 19th at midnight CST. Winners will be notified by email (the one you use to leave the comment below) and must respond ASAP! We love Hawaiian Falls, hope to win! Would love to win season passes! Shared! We would LOVE to win!!! LeAnn Miller shared a link. Professional organizer and NTK contributor Lorraine Brock talks about ways to dispose of your clutter in her monthly column. WE WOULD LOVE TO WIN TICKETS!!! THX!!! I hear this is a great place! Would love to win! I “Like” and shared this post. Would love to win! Call me crazy but this seems like it would be lots of fun for my daughters and I! Couldn’t think of a better way to finish out the summer then stayin cool in the pools at Hawaiian Falls!!! 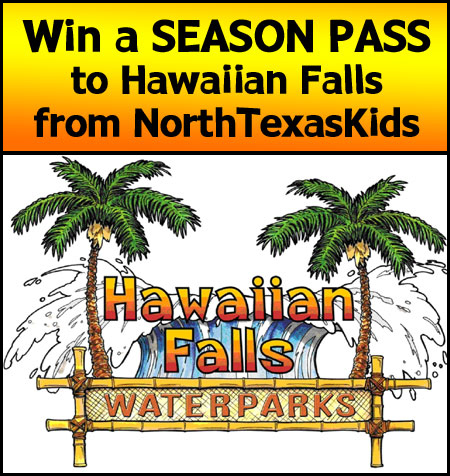 With 4 very active kids who love Hawaiian Falls, this would be awesome! My birthday is on July 29th and this would be not only a great gift, but a great way to celebrate another year of life with my kids, we’ve never been there before!! I only ment to enter once — it said the URL was a duplicate so I did not think it allowed me to enter it and not sure how to delete one of the entries. We just moved to the DFW area – excited to try new things! Love to take my kids as money is tight and haven’t been able to take them on a summer vacation. Kristy Huett Cole shared a link. The family would love to win this trip it would make a nice little vacation. It looks like a fun and amazing place! Ready to go! !